Waiting for who knows what? 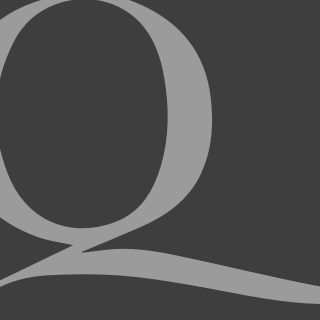 As the Government continues to pursue the imminent introduction of an Emissions Trading Scheme more and more questions are being asked about its scientific foundations by highly qualified scientists and others. Yet these doubts are simply being disregarded. This is a high risk path with no apparent ability to back-down if the entire edifice is built on sand. Scientific evidence confirms that human activities such as burning fossil fuels (coal, oil and natural gas), agriculture and land clearing have increased the concentration of greenhouse gases in the atmosphere. As a consequence the earth’s average temperature is rising and weather patterns are changing. This is affecting rainfall patterns, water availability, sea levels, storm activity, droughts and bushfire frequency putting at risk Australian coastal communities, health outcomes, agriculture, tourism, heritage and biodiversity for current and future generations. This statement comes in part from the Drought Exceptional Circumstances Report of the Centre for Australian Weather and Climate Research, a combination of Bureau of Meteorology and CSIRO scientists. Their report summary highlights an increasing number of exceptionally hot years and exceptionally low rainfall years but also contains a caution about the uncertainties of the projections. The Minister for Climate Change appears to have ignored the warning in the report disclaimer that "Any person relying on the assessment does so entirely at his or her own risk". Unfortunately it is our collective risk. Although Garnaut does acknowledge the science has uncertainties, the Garnaut Report simply accepts this catalogue of impending climate extremes as the foundation for its recommendations on emissions trading. However there are some inconvenient facts that might indicate that this "weather" report is of little if any value. In 1963, a study of 75 years of Australian rainfall by Professor Sir Samuel Wadham, R Kent Wilson and Joyce Wood concluded that "nowhere in the world is there such a huge area of pastoral land of such erratic rainfall as this pastoral country of Australia", adding that "the immediate effects of violent fluctuations of climate on the development of agriculture are considerable, but their ultimate effects are much greater than are normally appreciated." If this is the case how do we verify the predicted future given our erratic past? You have only to compare the global and Australian temperatures over the last one hundred years to see our climate variability compared to that of the planet as a whole. The main features of the global temperature variations (Figure 1) are a rise from 1920 to 1940, a plateau or slight decline from 1940 to 1975, a rise from 1975 to 1998 and then a plateau. It should be remembered that complete coverage of the atmosphere only began in the 1970s with satellite data. This provided measurements over the oceans, 70 per cent of the surface of the earth, which had previously only limited coverage. 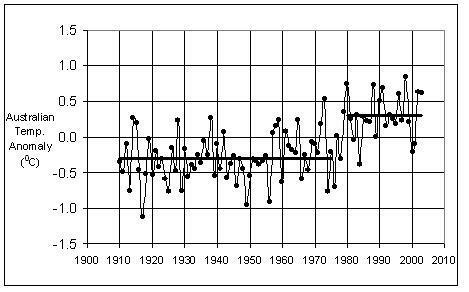 The Australian temperature record (Figure 2) can be most simply described as one of long periods of temperature fluctuating within a limited range with a step up of 0.6 C between 1975 and 1980. A very important point is that the much greater year on year variability in the average Australian temperature, as compared with the global average, must in part be a reflection of the inability of a continental land mass to store heat, unlike the oceans where a smoothing of temperature variations takes place. Figure 1: The global temperature anomaly derived from ground measurements by the Hadley Centre and mid-troposphere from satellite analysis at the University of Alabama, Huntsville. Figure 2: The Australian temperature anomaly calculated by the Bureau of Meteorology. The solid lines are the averages from 1910 to 1975 and 1980 to 2003. The difference between the two periods is 0.6 C.
The temperature step of 0.6 C between 1975 and 1980 appears to be largely due to the Great Pacific Climate Shift of 1976, an event whose origins are uncertain but widely acknowledged, even in IPCC reports, as having nothing to do with increased emissions. In 1997, researchers at the University of Washington reported that a multi-decadal oscillation in Pacific sea surface temperature and pressure had been discovered, while trying to explain decadal changes in salmon fishery production. 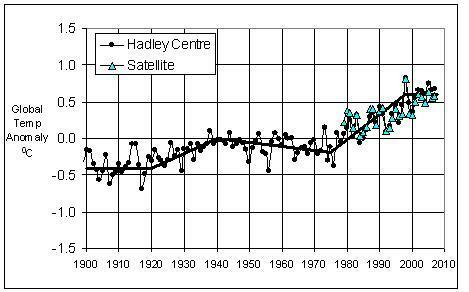 They called it the Pacific Decadal Oscillation and the 1976 event became the Great Pacific Climate Shift. In 1976, the Pacific Ocean underwent a major transformation in sea surface temperature patterns. Suddenly warm water replaced cold water that had dominated the sea surface for most of the prior three decades near the west coast of North America and along the equatorial eastern Pacific. All these are observations but not an explanation that provides any basis for predicting the likely future trend in temperature. In fact, the source of the prediction of increased frequency of extreme events comes from computer models of the atmosphere and its interaction with the oceans. But how can you verify these predictions if the models have no basis for determining the occurrence of El Nino events or the more important decades-long effects that gave rise to the Great Pacific Climate Shift? Yet the reality is that they appear to be one of the determining causes of temperature changes, one that is far from being understood as to timing or magnitude. If we are unable to understand the interaction of the oceans with our atmosphere on a global scale then there is no reason to believe that regional predictions would be of any value. The adoption of the BoM-CSIRO predictions by Garnaut and the Minister for Climate Change is a high risk strategy where we have little idea of the range of likely outcomes. Ross Garnaut has apparently imitated a behaviour pattern well known to him from the Pacific Islands, the Cargo Cult. He, like the Treasury modellers, assumes that some technology will come along and save us all from having to abandon our high energy diet. Bjorn Lomberg suggests that we should defer any action and just sit on the beach and wait for the arrival of the new technology. Some would say that we already have the technology to hand in nuclear power! We might do better to follow Lomborg, sit on the beach and wait for the nuclear reactors to arrive. But if the Garnauts and Lomborgs of this world are so confident that new technology to replace fossil fuels is just over the horizon, why do we need to accept the early introduction of any of the emissions reduction policies being promulgated at international conferences?